Faraday totally doesn't get why this was rejected. Maybe it's because he identifies so well with the card...? Ummm.... Not sure that I get why it was rejected, either. 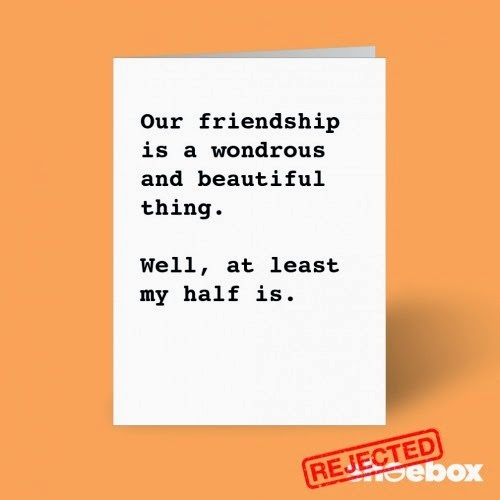 Well, Faraday, Hallmark may have rejected it but we've seen it on cards of other brands, so someone gets your sense of humor! Actually we like that LOL. Have a terrific Tuesday. Hmmmmm Dat's vewy innewestin'. Wejected huh? Well guess it's back to da dwawin' board. Bwahahaha! That IS funny! Faraday, we're not sure why that one was rejected, either! Faraday, Newton agrees with you wholeheartedly. ha ha it is funny, but I can see why it was rejected. BOL, typist thinks that's brilliant!! 50% is better than none ... isn't it? I think Waffles wanted to give ME that card.